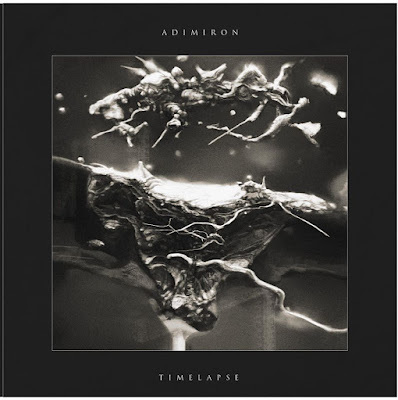 Since 2004 Italian quintet Adimiron have forged their own brand of progressive orientated form of metal for several years on the continent. With three well received albums albums to their name, and a slew of high-profile international tour supports with the likes of Annihilator, Death Angel, Suffocation, Meshuggah, Sepultura, and Vader so far the band look set to break out from beyond their European stomping ground with the release of 'Timelapse', a collection of songs that combine technical wizardry and a strong avant garde streak running throughout. From the onset of 'Timelapse' the band invoke influences from the likes of Tesserect, Gojira, and textures in particular with their blend of unhinged rhythmic structures and layers of irregular textures filtered through technically adept thrash-tinged metal. Songs such as 'Collateral', 'The Giant And The Cow', 'Timelapse', 'The Burning Of Methuselah', and 'Ayahuasca' exemplify the best of the band's song writing skills as they combine brutal riffs and thunderous drums with strong melodies to create a rich, intelligent but most importantly accessible formula. The album is mixed well and has a sleek modern production that recalls the likes of Dark Age, Fear Factory and Meshuggah to give it a visceral yet polished sound that maintains the balance of heavy and melodic elements nicely. 'Timelapse' is simply a bludgeoning beast of an album. It's fast, technically proficient and throws you plenty of curve balls to keep you guessing. It is a prime example of what can only be described as “thinking man's metal”. Sure it preserves the angst-ridden heavy riffs that thrash metal has fostered for the past thirty years. But their avant garde approach and progressive textures add so much more to the listening experience. Hopefully 'Timelapse' will prove to be the album that makes Adimiron a headlining band in their own right.